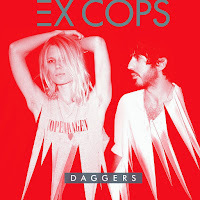 Ex Cops - Amalie Bruun and Brian Harding - return with their second LP, Daggers. Stuart Ralston shares his thoughts. Bruun and Harding hail from Brooklyn and enlisted Billy Corgan to act as executive producer on this their second LP, the follow up to their 2013 debut True Hallucinations. Corgan's influence is apparent from the off. The album opens with a series of New Order / Other Two-esq pop tunes. Black Soap is dominated by a bass line Peter Hook would be proud of, and a real summery pop vocal from Bruun. The synth pop of White Noise follows before Teenagers leaves me feeling somewhat flat. I'm almost tempted to put something else on the stereo but I stick with it. Title track Daggers re-engages me slightly. Early tracks such as Black Soap and White Noise are likeable enough but unusually, Ex Cops have saved their best songs for the tail end of the album. Modern World sees the duo share vocal duties and really gets things back on track. Modern World is more driven and determined than many of its predecessors. Wanna Be is the most stripped back track on the album, allowing Amalie Bruun's impressive vocals to dominate. Rooms is another stripped back song, and for me, this is when Ex Cops are at their best. The MaryChaintastic Weird With You brings the album to a close. Daggers suffers in parts from that difficult second album syndrome. For me, it lacks a little cohesion in section, but as it progresses there are some genuine nuggets on here that are well worth checking out. Ex Cops official website can be found here. They are also on Facebook and Twitter.